In our last post we examined how my company used a data-focused approach to identify what IT resources were working on. Data is collected through publishing and reviewing the information in project plans and timesheets. Aggregating this information provides visibility to senior management about the alignment of work on their projects and portfolios. This led to improvements in performance and utilization, and provided critical data for informed decisions on investments. In our IT department, we use a chargeback system to allocate costs to other departments utilizing our resources. If executed well, this can be an efficient way to allocate costs and maintain a productive workforce. After analyzing data, the IT PMO found that some projects managed chargebacks better than others, but improvements could be made across the board. If a project team was especially inefficient at charging back costs, it was at risk for business units to add unapproved work where the costs would be absorbed into the general IT budget. Since contract work is an external cost, it becomes one of the most acute contributors to any chargeback problems. Contractor costs are highly variable, immediate and direct; so many would argue that this group needs the greatest management. As shown in the previous post, we improved visibility to what all resources were doing; however, the costs associated with contractors were not as clear and were not optimally managed. Largely this is due to the number of contractors, the number of vendors, billing cycles, and the projects on which these resources worked. The most difficult set of contractors to manage are those that are hired to augment existing skill sets in infrastructure. These resources typically work across multiple projects on work specified by their resource manager (e.g. lifecycle, operations, break/fix, etc.). During the period we are reviewing below, contract infrastructure resources averaged over 60 people and between $500K and $750K per month in billings. The majority of the work this represents was in non-Infrastructure areas (e.g. Applications, Information Security, etc.). Time worked must be entered by a contractor and approved by project/resource management, so contractor costs can be calculated from approved timesheets. This provides significant incentives for weekly timesheet submission and approval. By providing this information back to vendors, they can pre-match their planned invoices against amounts entered in our systems. When everything matches, vendors are paid expeditiously. As costs accumulate, it is easy to see what is being spent when and where. When contract resources are not working on projects, their non-project approved time is quickly identifiable and adjustments in the contractor workforce are made. Contractor resources costs were not charged back to projects very well. For example, this meant that the Infrastructure group’s contract resources did development project work that should have been paid for out of other cost centers. This caused budget over-runs in the Infrastructure group. 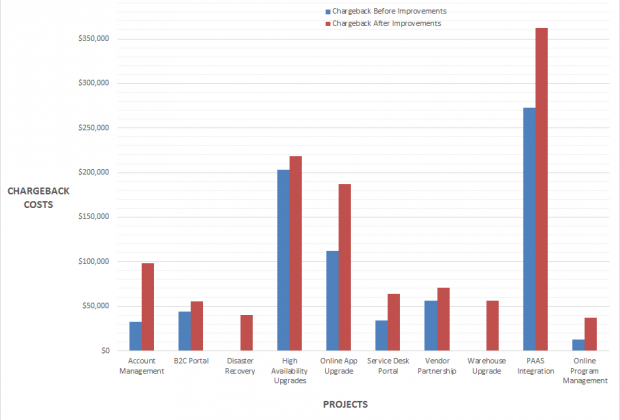 The charts below show data before and after process improvements were put in place requiring several months of effort. These improvements included requiring vendors to update historical timesheets. The desired outcome of more accurately managing contractor costs was to provide automation, controls and processes to insure the precision of both time entered and costs for all contractors. This allowed correct chargebacks and a way to measure contractor resource utilization. The 1st chart shows aggregate of invoices presented by all vendors for contract labor. Before implementing changes, the discrepancy between invoices and time-based costs was significant. Once the changes described above were implemented, historical corrections for missing data were made and data management improved. The 2nd chart shows the average hours per week accounted for in the timekeeping system. Our company would always pay the invoice when a project manager confirmed that work was done. But that did not insure there was an accurate record of what specific project work was done. 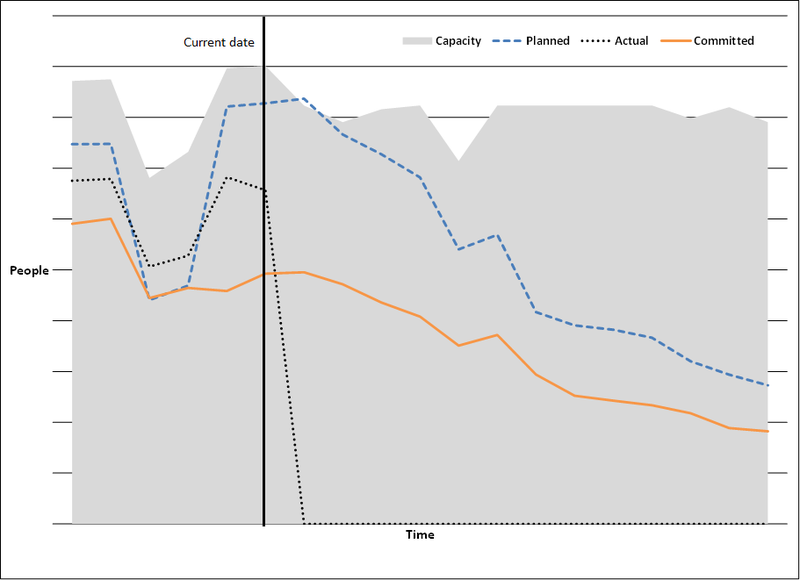 This chart shows the improvement made when vendors were forced to correct historical project timesheet entries. What does it take to make improvements in contractor labor cost management? Typically, time entry tasks are created by a Project Manager in a MSP project schedule. When the schedule is published, these tasks are available to the assigned resources for time entry. Once approved, these time entries are posted to the project schedule. However, the actual time in the project schedule can vary from a timesheet due to Project Manager errors (e.g. deleting tasks, marking a task complete that has remaining time, etc.). Therefore, only the original timesheet data should be used, rather than the project schedule actuals. Note that Microsoft does not store this data in the reporting database. Therefore it is necessary to use the transaction tables. Furthermore, it is important to understand the state of the time entry lines (e.g. approved, pending approval, rejected, etc.) and only use approved data. After driving the correction of timesheet entries, the amounts that could be charged back to specific projects was significantly increased. For the top 10 projects in the portfolio, this amounted to an additional $400K over the duration of the study period. The improved chargebacks allowed a more accurate tracking of costs on individual projects and better management of the core IT budget. Many companies expect IT to manage work for other business units and utilize a chargeback process to properly allocate the costs. If that process is not well managed, work that should be charged back gets absorbed into the IT budget, which in turn may mean that the company is not aligning spend according to strategy. The PMO can perform data analysis that can quickly pinpoint these problems, and stakeholder focus can deliver needed improvements to get things back on track.